When hiking, I basically have two paces: going-places-pace and noticing-things-pace. I When I’m heading to a destination I can walk surprisingly fast for my short legs, but when I’m walking for pleasure I like to go slow and gently, taking in all of the details. I’ve had friends say they see things completely differently when they’re in the woods with me; my friend Scott and I used to joke that only together did we notice the whole picture. When we would go out foraging, he’d point out the spectacular views to me, while I would pull him into my world of microcosms. On a scale of microscopic to satellite, where does your attention fall? Do you notice the distant mountains embraced by clouds before you notice the curly patterns of fungi at your feet? Or do you see the puzzle-piece bark of the nearest Ponderosa before you become aware of the stunning waterfall up ahead? Having an awareness of your way of interacting with the world can be a powerful thing; I now know to remind myself to look up and out sometimes during my wanders to take in the views beyond my little bubble of details. Likewise, I can appreciate that my focus on the miniscule and detailed is something that informs my work in every sense, from the hand-sculpted barnacles on my ceramic cups to treats like this that pay homage to the structure of a pinecone. In fact, those little details are what brings so much wonder to my life. There’s something about hidden or secret details that has always intrigued me. I distinctly remember a particular jewelry class in college when my instructor told us to consider the back of the pieces we were working on; that even though they aren’t visible to the outside world, it can be fun to add some details just for the wearer. Little secrets. I went on to create a series of brooches with intricate backs and simple fronts, some of my favorite pieces from that chapter of life. I’ve taken that philosophy to heart far beyond my time at school and I often include little surprises and details in my work, whether it’s a series of symbols that are actually my own secret language spelling out a message that only I know or a confection that looks just-so when it is cut in half. Whether or not others notice these details is unimportant; for me, they bring pleasure and wonder to the process of creating. These pine-cone confections are a perfect representation of hidden details and tiny wonders. They are vegan, gluten-free, and low in refined sugar. The are like something between fudge and a tootsie-roll, with a nutty and floral pine nut flavor. I crafted them in such a way that they’d have the same pattern as a real pine cone’s cross-section when sliced in half. Whether or not my recipients realized this was not important; for them, it may just have been a sweet treat with the occasional crunch of pine nuts. If you’d like to create your own, I would encourage you to set aside time to be present with the process. Rather than providing a recipe, I’ll be providing a guide for you to create your own perfectly moldable candy confection. This is partly because the consistency of the ingredients varies so much, and partly because it’s so rewarding to figure out the process for yourself. In a food processor, grind the dates and pine nuts to make a smooth paste or butter. Add some cocoa powder to taste - I prefer a subtle chocolate flavor that doesn’t overpower the flavor of the pine nuts. If your dough is too oily or sticky, knead in some powdered sugar until it is work-able. Make a small oval and press pine nuts into it to form the core. Press a thin layer of dough over the pine nuts to encase them. 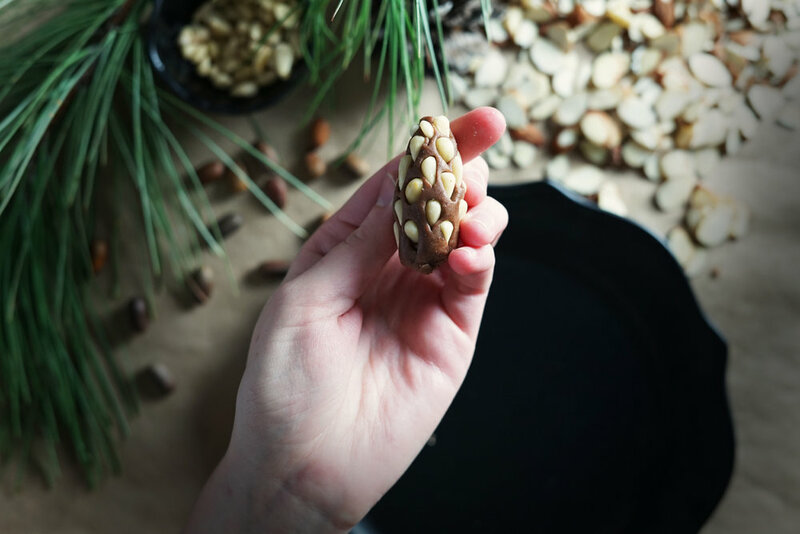 Gently and carefully press the almond slices into the core to create a pinecone shape. When you’re satisfied with your design, dust it with a bit more cocoa powder for a realistic look. These will keep in the fridge for a couple of weeks, but are best consumed soon after making them.